In this review of the Rockville BPA12 we are going to covering 5 important areas which include key features, what we like, pros and cons, who is this product best suited to and what customers who have bought the speaker are saying about it. We love the professional quality of this speaker and the high efficiency components are a highlight. 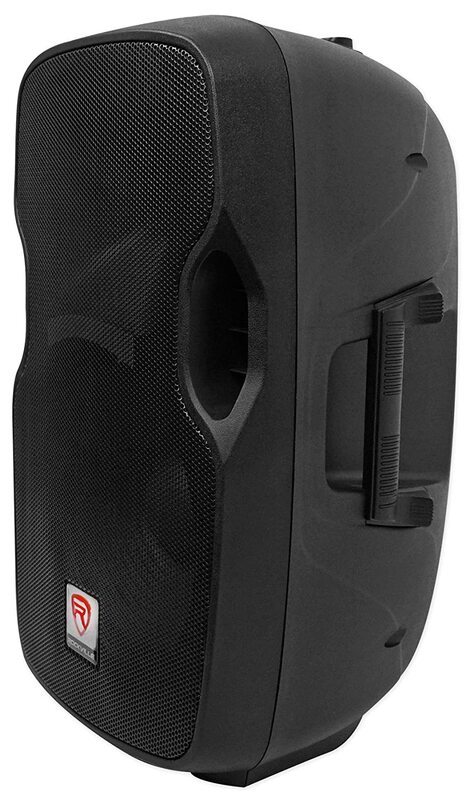 Not only is the rockville BPA12 speaker professional in sound and appearance, it provides many great features that make it stand out among others in the same price bracket. LCD Screen – Sometimes it is nice to have special features that can help make the overall user experience better, not to mention easier. With the Rockville BPA12 model, the easy to read LCD screen display and wireless remote make DJing with this speaker fun and hassle-free. Lightweight – If you are a DJ or entertainer that travels often for your job, you will want to invest in a speaker system that is easy to transport and is lightweight so that you don’t have to hire help to load and unload your equipment. The lightweight build of the Rockville BPA12 makes this speaker easy to transport to gigs and is also easy to store when not in use. Technological Features – The Rockville BPA12 professional speaker includes a USB input, SD input and Bluetooth integration. USB and SD inputs are important for those who want to play back music easily. Further, the Bluetooth technology feature allows the user to seamlessly stream music from a smartphone, MP3 player, or other device. The Bluetooth range is generous at 32 feet which makes distortion-free playback possible. There is so much to like about the Rockville BPA12 speaker that it makes it a challenge to pinpoint a few highlights. The fact that this speaker offers 600 watts of peak power and a liberal bluetooth range makes it a favorite amongst those who are in search of convenience and great sound quality. 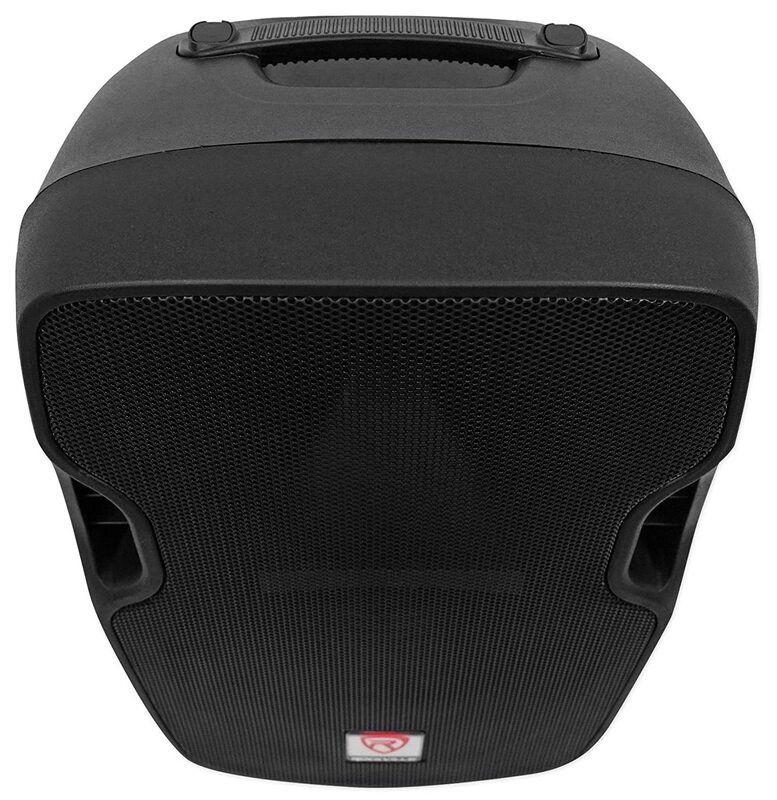 Ideal for Playing Music –We love this speaker set for playing music at a wedding, cocktail hour, or small ceremony, however we do not advise this speaker as part of a DJ’s main setup. Generous Range –The 32 foot Bluetooth range is quite generous which makes playing music from your smartphone or tablet easy and convenient. 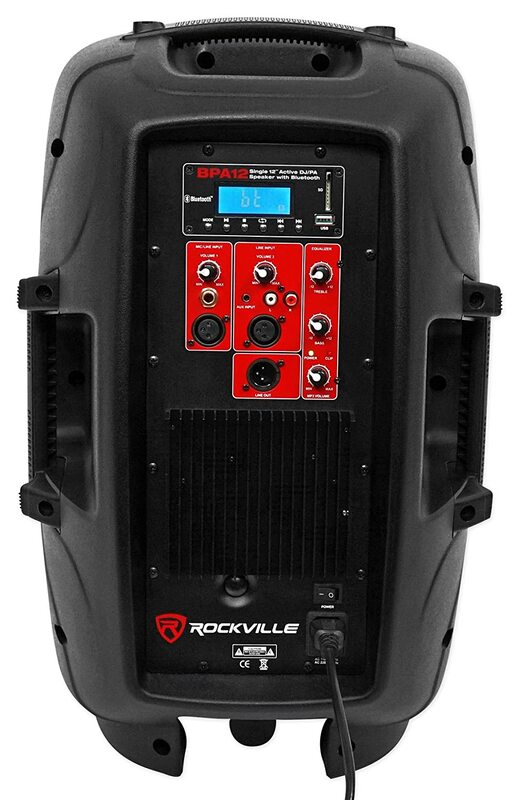 Efficient –The massive amounts of power that can be produced from the Rockville BPA12 speaker will blow you away for the size and scope of the piece of equipment. 600 watts of peak power is what makes great highs, mids, and bass possible while being a super-efficient piece of equipment. This speaker is ideal for someone who is looking to start out with a small DJ career. Playing music at a small wedding reception, school dance, house of worship, or to entertain a small crowd is ideal for the Rockville BPA12 speaker. If your goal is to entertain or host a larger party, you will want to invest in a speaker system that is more robust and can provide a wider range. Another great way to use this speaker is to hook it up as a home entertainment system or use it as an entertainment system for a school function, fitness class, or work function. As long as you plan to entertain a small crowd and do not need to project sound to a sea of people, the Rockville BPA12 will work just fine. Customers appreciate that the built-in amplifier is powerful and can be connected to a subwoofer for additional power. Customers are also raving about the generous bluetooth range and the clear highs, mids, and bass that can be produced by this speaker. Finally, customers note that the speaker should not be used in snow, rain, or wet weather and it does not include a rechargeable battery so should be utilized indoors when possible. 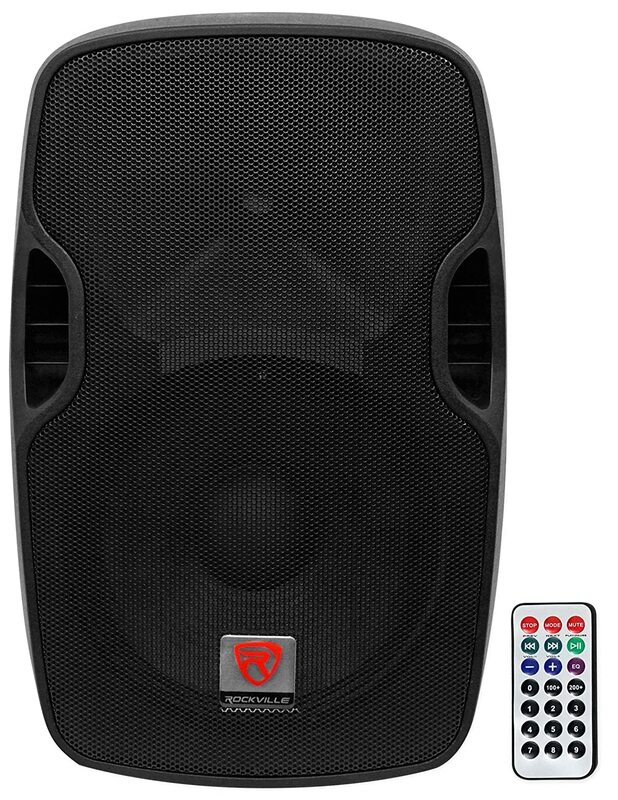 The Rockville BPA12 speaker is lightweight, offers a liberal amount of peak power and includes USB and SD input. The bluetooth range is exceptional which makes playing music from your phone, device, or MP3 player an easy feat to accomplish. Ideal for small house parties, this speaker will provide a clear range of mids, highs, and bass.